If you’re struggling with a small or awkwardly shaped room, it can be tricky to find a dining table that complements the space. A round dining table helps fill the area while providing ample seating options and plenty of style. At Brosa, we have a selection of exquisite round dining tables in a variety of design styles. A classic all-wood dining table with elegantly carved legs is the perfect accompaniment to a French Provincial or Traditional dining room. Meanwhile, a dining table with blended materials - such as a concrete table top and steel or wood legs - fits an Industrial room to a tee. We have a range of dining chairs and other furniture to match your chosen table, or you can mix up the elements to create an eclectic look that is truly yours. A round dining table is a delicate, beautiful piece that demands expert craftsmanship. That’s why at Brosa, we only work with the best designers and superior materials to deliver you sublime furniture built to last. 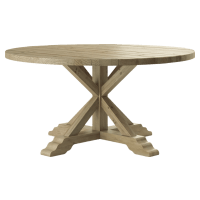 Browse our full range of round dining tables online today and order now to receive a top quality piece delivered direct from the designer for less.